Where people come first We care for you with professional team and broad certificated doctors. All operations will be performed by doctors included hair transplant. NOW: Email pictures of your head to info@aestepoolclinic.com to get a quote and free consultation! Click Here! Today we perform hair transplant to more then 60% of hair loss diagnosed patients there are different technics all over the world. First of all there is a technic called FUT which was an old technic nowadays but it was very popular from 90s to beginning of 2000s. It is also called strip method because surgeon cuts a piece of scalp skin from the back and then stitch it. Then harvest the hair follicles from the skin piece. That was brilliant but there are disadvantages together with advantages as patient will have a scar on the back and maximum graft harvested in a session is around 1.500-2.000. First step is harvesting:It takes 2-3 hours. We harvest hair follicles one by one by micro-motors from the back side of scalp it is also called donor area. 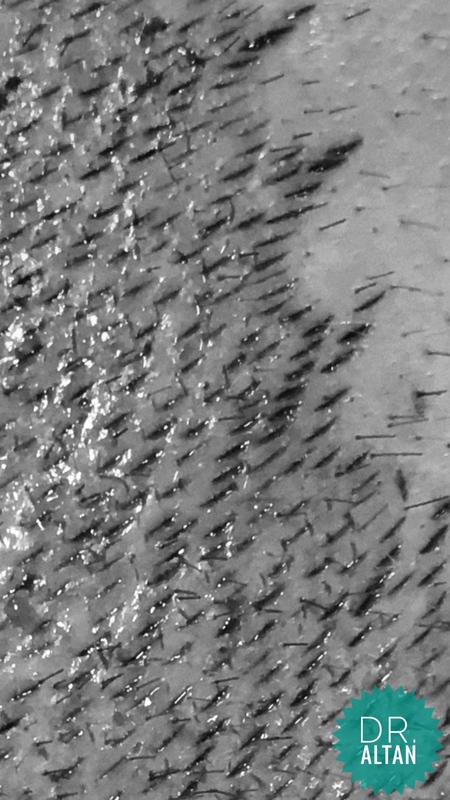 We choose to harvest hair follicles from the back because genetically they are not falling like frontal area or crown area and when we implant them to other areas they are as they are so they wont fall again as they protect their genetics. You can see a good donor area picture on the left. There are also other areas like chest or beard as donor area if patients donor area is not enough but first problem is they are prone to fall again and second they wont be seen natural because chest hair is generally curly compared to scalp and beard hair is thicker then scalp hairs so we do not use them too much and they are generally last chance. 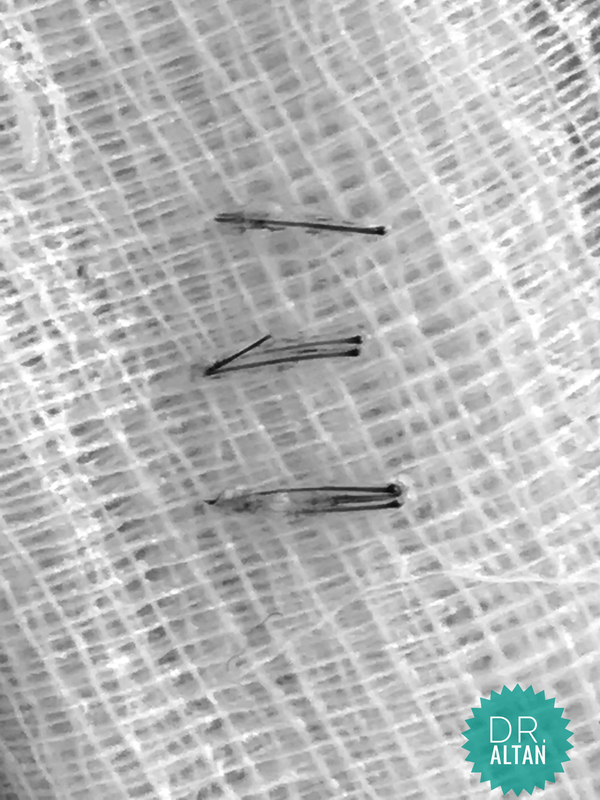 Hair follicles from the back (donor) area can be 1,2,3,4 hairs from one root and we count them as graft. A graft is a generic term for any piece of hair-bearing tissue that is transplanted into the scalp. So during operation we count them one by one as a graft and count in hairs will be much more for example if you have 4.000 grafts harvested from donor area it means average 9.000-11.000 hair pieces. Dr. Altan’s MicroFUE is called MicroFUE because we use smallest punch in the world as it is 0.7mm and advantages of smaller punch is no pain after operation also no scar at all even not point scars. Before going to the second step we design patients hairline and make a plan for opening channels then share it with patient if he likes it we continue if no we continue drawing it until patient says yes I like it. By the way hair line is not depending on doctor nor on patient because we can not draw it lower then frontal muscles. Second step is opening the channels:It takes around 1 hour. In this step we open channels it means making some new holes for new hair grafts. It is very important for channels to as much as close possible without unite. If they are not close enough results will be less dense and if they unite they will cause scar. You can see picture on the right Dr. Altan’s MicroFUE and opening patelliform(flat) channels. 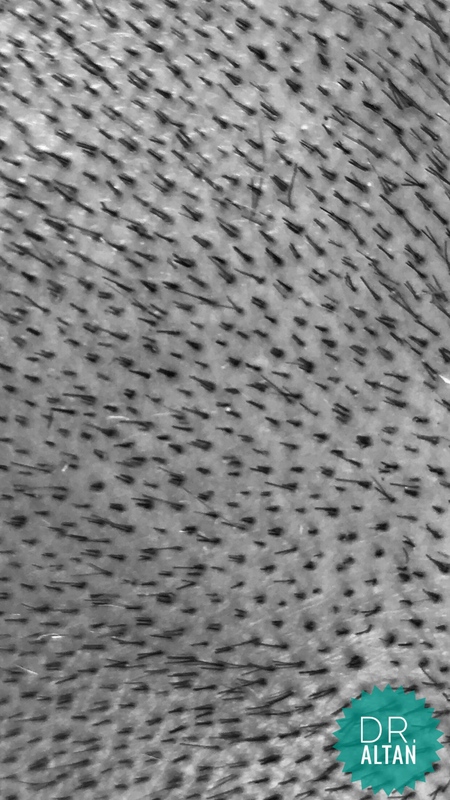 Advantages of opening patelliform channels is we can design it as close as possible (compared to round channels or Choi pen) and they heal very fast because they close as it is before. We know the grafts count before open channels so if there is 4.500 grafts there will be 4.500 channels. Choi pen is a pen-like device and opening channels and implant follicle in the same time it can be a good choice for woman who don’t want to cut her hair or man with very limited hair loss. But if it is an area hair loss or total hair loss there is no point to perform operation with round-channels. 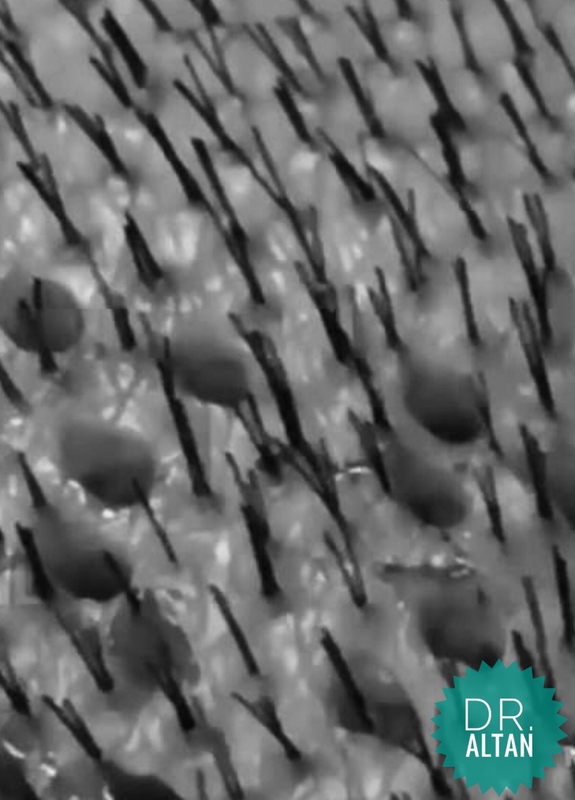 Third step is implanting hair follicles to the channels. It takes 3-4 hours. e, graft size to match when implanting and bigger grafts bigger channels should be done during second step. We implant them as a zig-zag array to the frontal area because normal human hairline is not like a straight line otherwise it will be seen like doll-hairline. During implanting hair follicles we wash it with saline solution spray not get dry and cause scabs after operation. 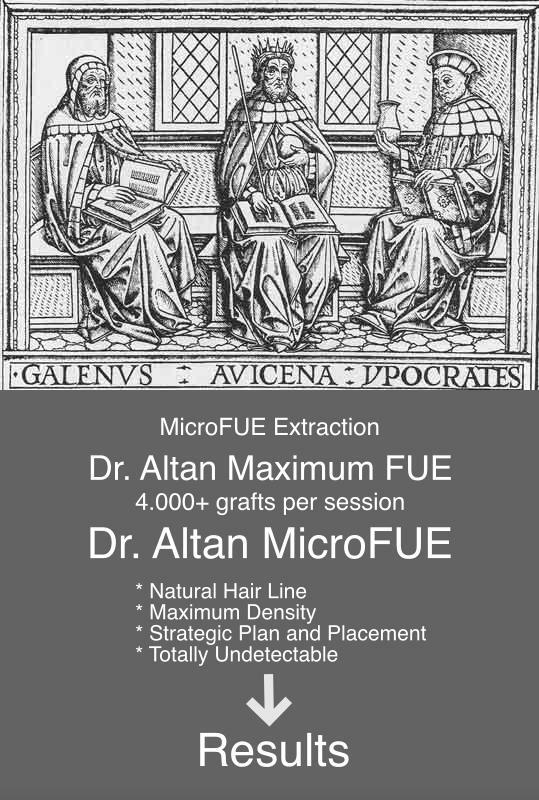 Dr. Altan’s MicroFUE method focuses on Accurate Design, natural hairlines, maximum density and strategic placement. Every patient for us is important and we will work maximum for every patient. Whatever is your graft count necessity we have availability to achieve it without harming the donor(occipital) area. Dr. Altan’s MicroFUE method is scarless and painless with last technology Micro-motors. 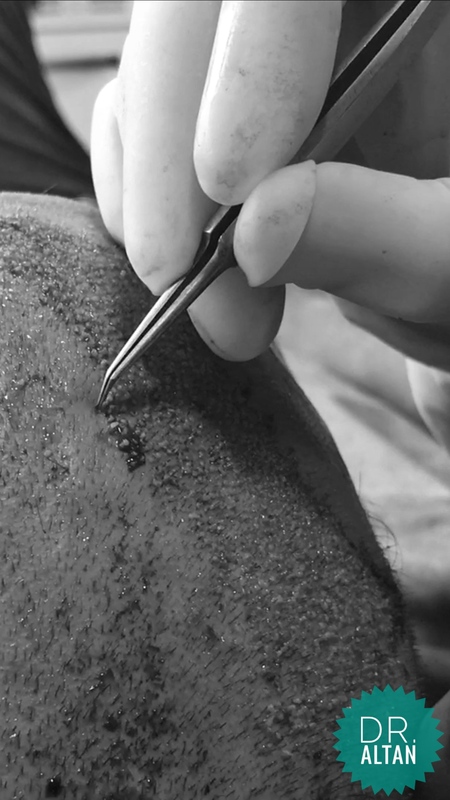 If you want to wear your hair short after the operation or don’t like pace around with scar on back of your head so you are a good candidate for MicroFUE because it does not leave any kind of scar tissue. You can enjoy your breakfast in the morning before the operation. Do not consume cola or coffee because they contain caffeine. Recovery time is minimum and you can continue your normal life after 1-2 days.